On May 13, Lingwen Pema Kelsang teaches Sanskrit to students in his home. 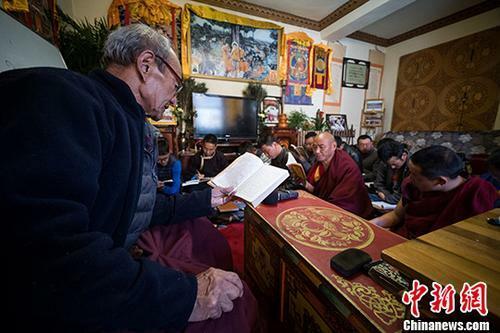 In Lhasa, in a retired living community near the Potala Palace, 81-year-old Tibetan Sanskrit scholar Lingwen Pema Kelsang is giving a lecture to his students. He sits on the sofa in his home with a blackboard situated to his left. Lingwen Pema Kelsang’s hometown is near Yamdrok Yutso Lake. In 1950, at the age of 23, he came to Lhasa to study Tibetan. 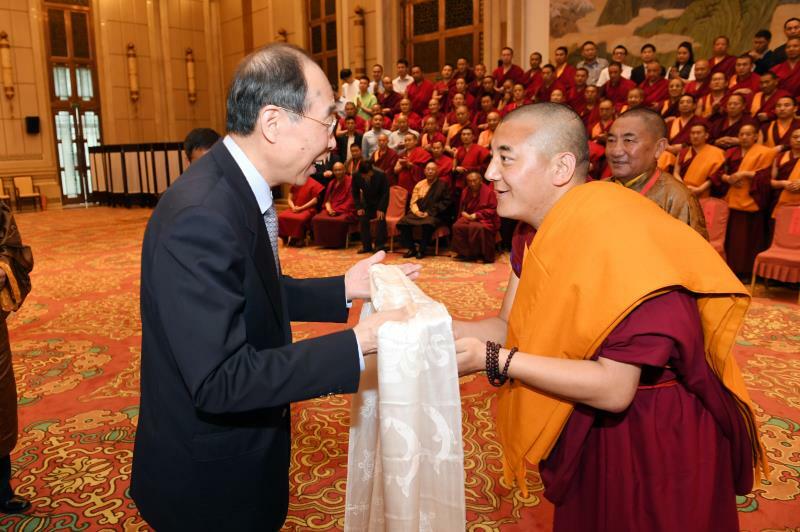 “Five years of studying Tibetan laid the foundation for me to learn Sanskrit later on,” he said. According to his memory, during the school year, Lhasa had two public schools that offered Sanskrit lessons to monks and aristocrats. Much of Tibetan literature was translated from ancient Sanskrit texts. In the 1980s, Lingwen Pema Kelsang worked in the Institute of Religion at the Tibet Autonomous Region Academy of Social Sciences. He often did not understand the Sanskrit texts and was unable to dig deeper on certain research topics. Taking the Buddhist concept of “non-self”, for example, which Chinese and Tibetan both have, but in order to understand it more accurately, it is necessary to trace the origin and use the original Sanskrit interpretation. Lingwen Pema Kelsang said that there is a consensus among Tibetology scholars that to be a true scholar, you must study Sanskrit. In the early years of Reform and Opening up, the atmosphere for research on Tibetan culture was strong, but the Sanskrit heritage was incomplete. In order to better preserve and pass down Tibetan culture, in 1983, Lingwen Pema Kelsang visited the well-known Sanskrit scholar, Tsore Tsenang Rinpoche, to study Sanskrit under him. “Here is a photo of my teacher and me back then,” he tells reporters, pointing at a photo on the wall. At that time, there were very few people studying Sanskrit, and his teacher hoped he would be able to carry on the tradition. After spending seven years learning and accumulating knowledge in Sanskrit, in 1990, with his teacher’s arrangement, Lingwen Pema Kelsang had his own first class to student. "In the beginning, he taught Sanskrit to his family and friends. After a while, more and more people came to study," Lingwen Pema Kelsang’s granddaughter, Lingwen Tsering Dekyi, said, adding that as long as one came and asked to learn, her grandfather would not refuse them. She says that before retiring, her grandfather would only hold classes on weekends, but now he holds them every day and rarely rests. Lingwen Pema Kelsang has taught more than 1,000 students since the 1990s. 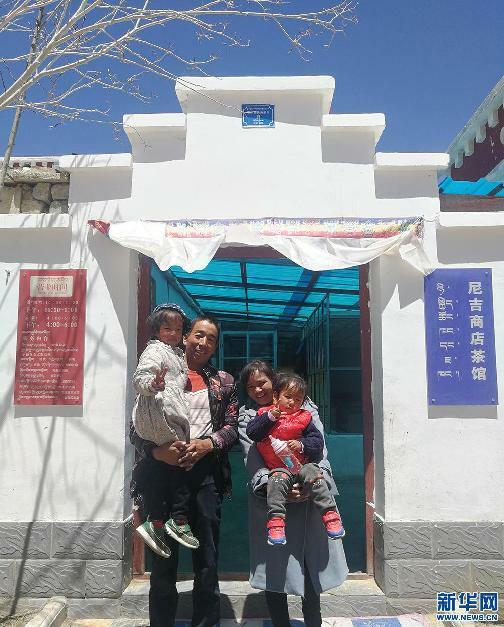 Odrol Tsering, a deputy researcher at the Pattra Leaf Scripture Research Institute of Tibet Autonomous Region Academy of Social Sciences, and Gyurmey Tsechen, a scholar at the Norbulingka Administrative Office, are both his students. 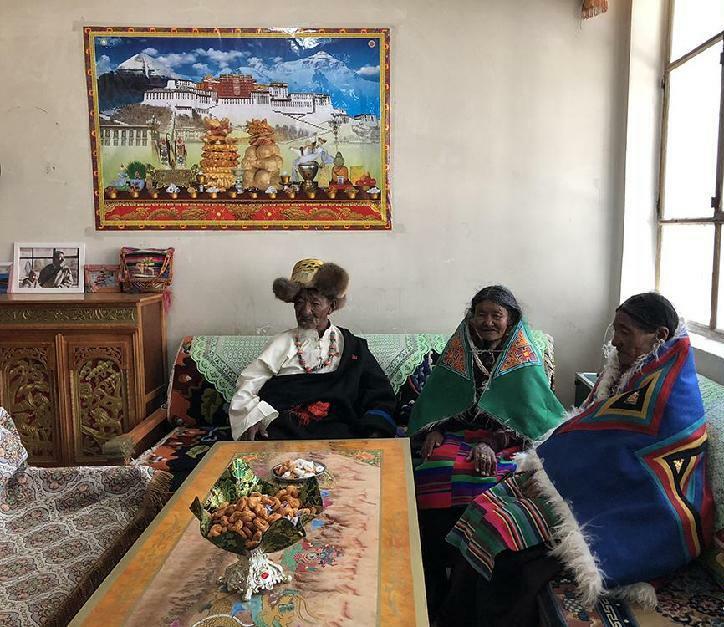 Because they had previously studied Sanskrit from Lingwen Pema Kelsang, they were able to participate in the eight-year project to research Tibet’s Sanskrit pattra leaf scriptures, which was initiated by the Chinese government in 2006. In addition to giving lessons at his home, Lingwen Pema Kelsang often visits the Tibet Autonomous Region Library, universities, and gives teachings to the public. 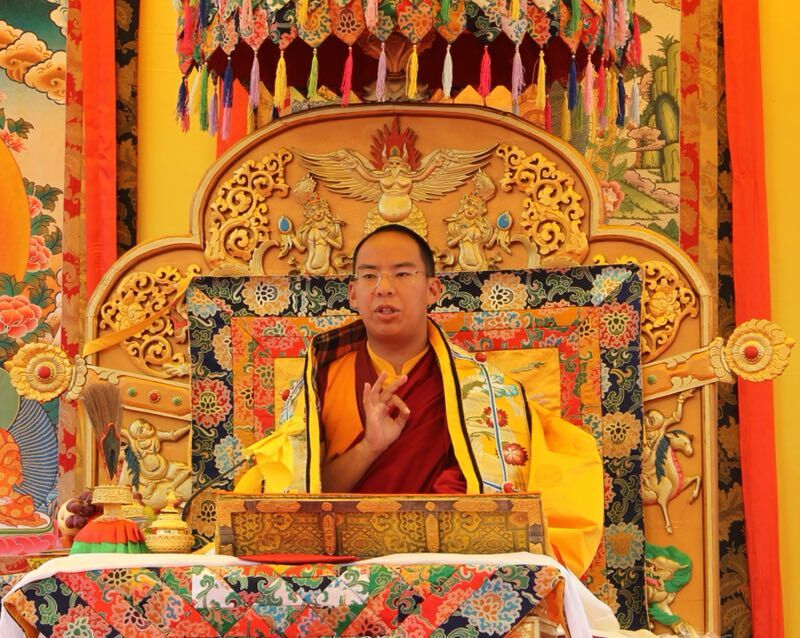 He also regularly visits monasteries to teach Sanskrit to monks. 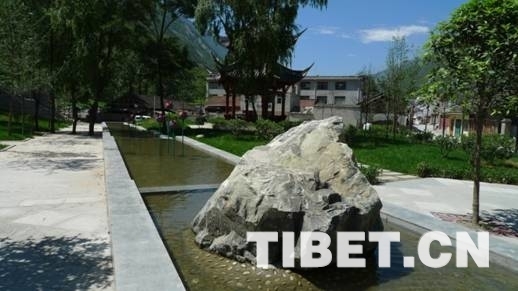 In contrast with the past, he said that after the popularization of nine-year compulsory education, students’ level of Tibetan has generally improved. The foundation for learning Sanskrit is more solid than before, and more people are interested in learning it. However, Lingwen Pema Kelsang has his regrets. He has been studying and teaching Sanskrit for 35 years, but Sanskrit is a profound language. He still has a long way to go before he has a thorough grasp of it.